Liverpool career stats for Ephraim Longworth - LFChistory - Stats galore for Liverpool FC! Right-back Ephraim Longworth was one of the most consistent defenders Liverpool have ever had on their books and his career at Anfield from start to finish covered a remarkable 18 years. Had World War I not taken away so much of his professional career, he would certainly have played in over 500 Football League and FA Cup matches for the club he served so loyally. He was so described in Fulham's match programme ahead of their duel with Liverpool in the FA Cup in February 1912: "Resourceful to a degree, he combines dash and cleverness with fine effect, and his kicking is always of high standard. Longworth played five times for England making his debut at 32 years and 190 days of age and is one of only a handful of Liverpool players to ever captain his country. What is remarkable he wore the captain's armband for the first time against Belgium on 21 May 1921 when he was aged 33 years and 231 days." A leading referee at the time, J.T. Howcroft, recommended him to Leyton in 1908 and Longworth made wonderful strides with the London club in his two seasons in the Southern league. Liverpool manager Tom Watson used his extensive contacts in the game and asked Michael Griffin, who had played under him at Liverpool, who was the best back in the Southern league, Griffin replied: 'Longworth of Leyton'. Longworth was signed by Liverpool on 9 June 1910 even though he had refused to move from Leyton a month earlier. Liverpool is said to have paid a club record fee for his services. After his third game for Liverpool, a 2-0 defeat against Everton, he was assessed by the Liverpool/Everton joint programme. "At full-back Longworth showed qualities which were eminently acceptable. For some seasons we have not been comfortable about our full-backs, and I must say that the Bolton youth is one of the most promising. He is not perfect, but that head save of a sure goal was as good as anything." Longworth's composed style of play meant that his position at right-back was rarely threatened during his early years on Merseyside. He played in the FA Cup final against Burnley in 1914 and would continue to be a key member of the team for several seasons after the war. He will forever be associated with one of the best defences in Liverpool's history that enabled the club to win the League Championship in 1922 and 1923. Longworth actually lost his place in the Liverpool team midway through the 1921/22 season to Tommy Lucas and resigned as captain contrary to the wishes of the Board and teammates. A scribe at the Derby Day Telegraph fully understood his reasons: "When a captain is left out of the side more often than he plays what can a man do?" 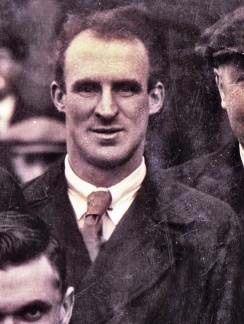 Left-back Donald Mackinlay was appointed captain in his place in January 1922. Longworth eventually regained his spot in the first 11 and featured in the last dozen matches of Liverpool's victorious season and was an ever-present the following campaign when the title was retained. Ephraim's final selection for Liverpool, at Birmingham on 21 April 1928, came over seventeen and a half years after he had been handed his debut in an away match at Bramall Lane, Sheffield on 19 September 1910. Remarkably, considering the number of matches he played, he never scored a single goal for Liverpool! Rob Jones and Stephane Henchoz later became famous for never scoring for Liverpool in an official game. Jones played 243 games and Henchoz 205 without getting on the scoresheet, but Longworth managed 370 games without a goal! To be fair to Longworth he did manage to score three goals in 119 war-time matches for Liverpool, but they don't count towards his official total. He revealed in the Echo perhaps why he struggled to score goals: "Some backs love to roam and I am convinced by practical effects that they are wrong. I don't disagree with any full-back going forward when he sees the open door as it were. But as a rule it is wrong for full-backs to wander. There is the vital necessity of defence to be remembered and any defence spreadeagled is asking for a peck of trouble. "Longworth joined the coaching staff at Liverpool following his retirement as a player. He is in Liverpool FC's Hall of Fame as he ranks with the greatest defenders the club has ever had. From the Lancashire Evening Post on 10 February, 1937. No player was ever easier to a club than Ephraim Longworth, whose Christian name sounds on, but it must be remembered that he plays in front of Elisha each week. Long may Longworth prove his worth. He is a credit to the game and his club. Ephraim Longworth remembers the Merseyside derby in 1911 56 years later!